Let’s face it, female bassists are underrated the world over. Today, we are shedding light on a few (and there are many) of our favorites. 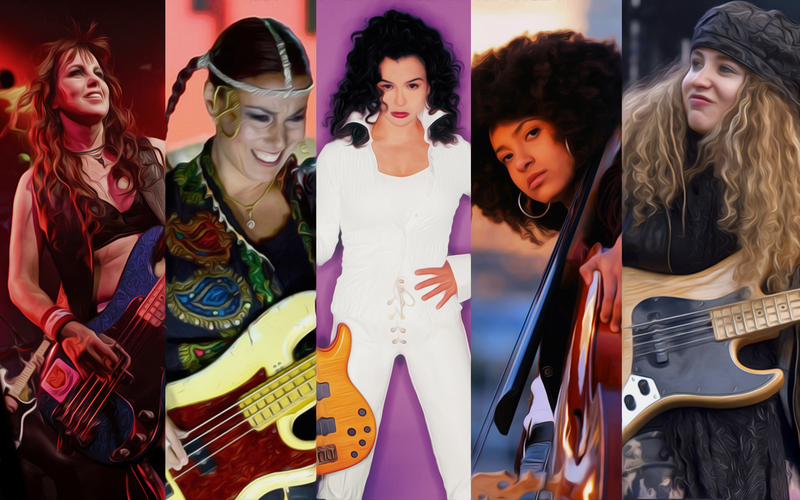 Since childhood, Canadian Rhonda Smith honed her skills at playing baritone horn and guitar before ultimately learning how to play the electric bass. She attended McGill University in Montreal, where she studied jazz performance in an attempt to tighten her connection to music. After achieving local success, she attended a music convention in Germany where she met the legendary Prince and went on to work with him for almost a decade, blazing her way towards further success. And this was just the beginning. Her desire to extend her reach allowed her to perform with the likes of Chaka Khan, Beyoncé, Larry Graham and many others. In 2000, Smith’s career catapulted with the release of her first solo album “Intellipop”. Born in Huntington Beach, California, Wanda Ortiz, also known as Steph Harris, is the bassist of the all-female tribute band The Iron Maidens. Her talents emerged at the age of 9 when she first learned how to play the double bass (upright bass). Fueled by determination, she taught herself how to play the electric bass at the age of 11 and went on to acquire a Bachelor of Music Degree from the University of California at Irvine. Before becoming an integral part of the Iron Maidens in 2002, Ortiz was the bassist of several bands and the winner of the Best Female Bassist award at the Rock City News Awards. Australian Tal Wilkenfeld is a 30 year old singer, songwriter, bassist and guitarist. Wilkenfeld burst onto the international scene through performing alongside some of rock and jazz music’s most notable artists such as Herbie Hancock and Jeff Beck. By the age of 20, she recorded her instrumental debut, “Transformation” and was able to compose, produce, arrange and play bass on seven intricate tunes. Her current band recently had the honor of opening up for The Who on the North American part of their 2016 Tour. Dubbed a musical prodigy, American jazz bassist and singer Esperanza Emily Spalding was playing violin in the Chamber Music Society of Oregon at the tender age of 5. Her outstanding skills earned her scholarships to Portland State University and Berklee College of Music. Spalding has 4 Grammy Awards under her belt- She is the first Jazz artist to win the Grammy Award for Best New Artist- as well as 7 collaborative and 5 solo albums…Did we mention she is only 32? Did we miss any of your favorite female bassists? Let us know here!